Fashion capital Milan gives way to the jagged, sun-drenched coastline of the villages of Cinque Terre, as refined elegance and untamed beauty unite in the contrasts of Northern Italy tour. 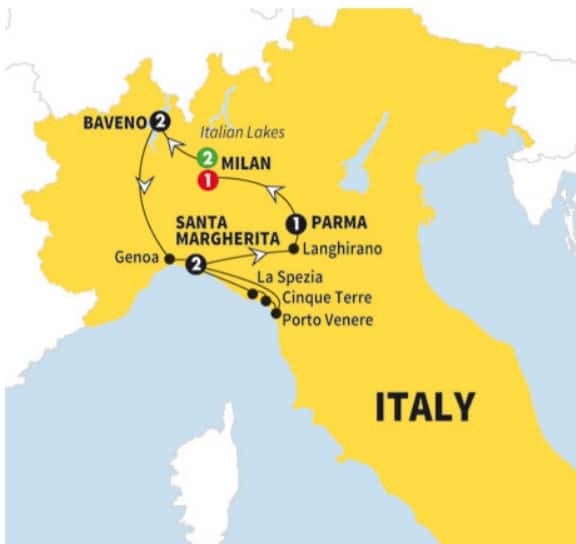 Cinque Terre, Milan, Parma, Italian Lakes, Genoa, the Italian Riviera, and Tuscany are all included on this escorted Northern Italy tour itinerary. Visit the northern Italy’s regions Emilia Romagna, Lombardy, and Liguria. For more information about this vacation to northern Italy and for the tour price with airfare submit the form or call ItalianTourism.us today 800.227.1577. 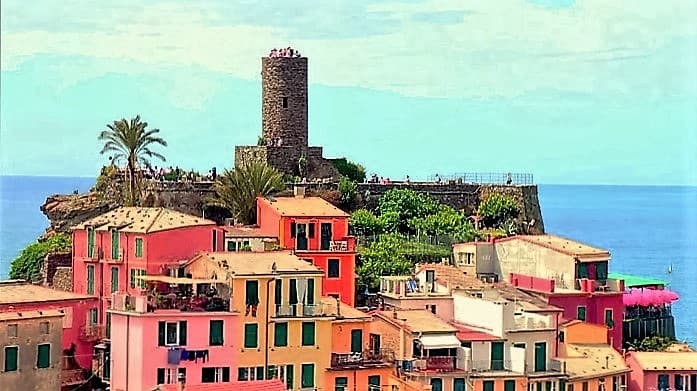 For Northern Italy tour Cinque Terre, Milan, Parma, Genoa and Lake Maggiore day by day vacation itinerary click here. Optional Experiences are subject to change. Your Travel Director will supply you with a final list of Optional Experiences available on your trip. Optional Experiences may be purchased during your trip through your Travel Director. Join the local expert tour guide for a tour of the Castello Sforza museum, where you’ll see the ‘Pieta of Rondanini’ by Michelangelo, among other great works. Your tour finishes with a visit to the world renowned ‘La Scala’ opera house and museum. When La Scala or the Castello is unavailable, you’ll visit the Museum of Milan. We’ve organised a private launch to take you to the beautiful islands of Lake Maggiore. Here you’ll see the Isola Madre, the Isola dei Pescatori, and on the Isola Bella we visit the magnificent palace of the Borromean Princes. The famous Centovalli Panoramic Train will lead you across dramatic viaducts, past deep ravines and beautiful forests. We’ll stop at a typical Italian Alpine Village, where you’ll enjoy free time to discover the charms of Northern Italian village life. Come with us to Pettenasco, on the shores of Lake Orta, to experience northern Italy’s best-kept secret. After you’ve had some time to stroll and take in the area’s beauty, you’ll cruise to the island of San Giulio, famous for its peaceful atmosphere and delightful church. Check the box next to the classic Italy tour you would like to join. Price published is for land only. Enter preferred departure airport above and submit form for air itinerary and price of Northern Italy Tour with airfare from your preferred departure city. Take in the sights of Northern Italy’s fashionable city Milan. Then enjoy time in Northern Italy’s Lakes District, spending time relaxing at the foot of the Italian Alps on the banks of Lake Maggiorre in Bevano in the region of Lombardy. Then take in the sun-drenched Italian Riviera coastline visiting Cinque Terre and touring Genoa, both in the Liguria region. You’ll also stay on the Tuscan seaside town Viareggio with time to visit the classic Tuscan town Lucca. Then travel from Tuscany and Liguria to the Emilia Romagna region to enjoy a tour of sophisticated Parma, one of the most refined towns in all Italy. The tour wraps up in the elegant northern Italian city Milan. Welcome to Milan. Transfers are available to your hotel. Relax after check–in and meet your fellow travellers and Travel Director for a Welcome Reception this evening. This morning tour Italy’s largest city and fashion capital Milan. In Milan you’ll be joined by a local expert tour guide who will take you on a walking tour of Milan’s beautiful historic center. Sights long the tour of Milan include Milan’s amazing gothic cathedral, its glass domed Galleria and La Scala Opera House. After the escorted tour of Milan you have the rest of the day at leisure to enjoy this exciting world-class city. Perhaps shop at the Made in Italy fashion boutiques. Stroll around the hip Brera district. You may also want to visit the Pinacoteca di Brera, a museum full of treasures including one of the most important works of art Mantegna’s Dead Christ. If you plan your trip early we may also arrange tickets for Leonardo Da Vinci’s Last Supper. You may also like to venture out of Milan for an optional excursion to nearby Lake Como. Today you’ll check-out of Milan and travel to Bevano, also located in the region of Lombardy. Located at the foot of the Italian Alps on the banks of Lake Maggiore in the heart of the Italian Lakes District. Lake Maggiore like all the Italian Lakes provides beautiful vistas and a nice laid back feeling. Today includes a tour of the botanical gardens of Villa Taranto and a drive by the lovely town of Stresa. Then you’ll check in to the Simplon hotel in Baveno. This afternoon you may interested to join the optional tour to the beautiful Borromean Islands. This evening enjoy an included northern Italian dinner with local wines. Today you’ll have a full day to simply relax and enjoy Lake Maggiore. Take in the natural beauty of the Italian Lakes District with the Alps backdrop. This evening you’ll take a private boat to an island on Lake Maggiore for a special local authentic dining experience among locals. Stop in Genoa, birthplace of Columbus, for an included guided walking tour of Genoa with a local expert tor guide. The tour includes viewing some of the Renaissance and Baroque palaces of the noble families of Genoa. You’ll also visit Genoa’s UNESCO World Heritage Site of Via Garibaldi. After the Genoa tour you’ll continue down the Ligurian coast to Santa Margherita on the Italian Riviera. You’ll check-in to your hotel and then have time to stroll around this seaside resort town. Today you’ll enjoy a full day excursion to the Cinque Terre. These five hamlets are set on the Ligurian sea. From sea level and up in the cliffs, these one of the kind pictuesque villages are quintessentially Italian. The Cinque Terre are now a UNESCO World Heritage Site. The Cinque Terre tour includes two of the five villages escorted by your local expert tour guide. After return to the Santa Margherita resort town to freshen up before an included dinner of authentic Ligurian cuisine. Today drive across the scenic Apennine mountains towards Parma – Italy’s cured meat and parmigiano capital. Near the town of Langhirano visit a working prosciutto factory where you’ll sample the best the region has to offer. After a brief photo stop at Torrechiara learn the process of making real parmigiano reggiano cheese at a family-run “caseificio” near Parma, as you gain a cultural insight into local cuisine. This evening consider the optional dinner and drive featuring local specialties with wine in a historic setting. This morning enjoy a guided tour of Parma with your Local Specialist. This gastronomic city in the Italian region of Emilia-Romagna is famous for its architecture, prosciutto and cheese. Enjoy a scenic drive back to Milan where tonight you enjoy a Farewell Dinner with your companions and Travel Director. This morning say ‘arrivederci’ to Italy as your Northern Italy tour comes to an end.